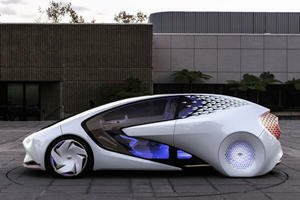 our generations down and the Toyota Prius still looks alien, but the front-drive hybrid is now better than ever before. A 1.8-liter gasoline engine pairs with two electric motors for a combined output of 121hp, paired to a CVT gearbox. EPA figures of 54/50mpg for city/highway driving are real-world achievable – other competitors struggle in this regard. The Prius Four trim offers simulated leather upholstery, heated front seats, and blind spot monitoring with rear cross traffic alert. Safety features on the Prius include standard forward collision avoidance, lane departure warning, and radar cruise control. The Toyota Prius is the car everyone loves to hate. But while it may not have grown out of its odd styling, where other competitors offer more stylish alternatives, there’s no denying the Prius’s success at being itself and doing what it’s intended to do. As the original hybrid, the Prius’s head start in the game has paid off – for anything more efficient you’ll need to go PHEV or full electric. 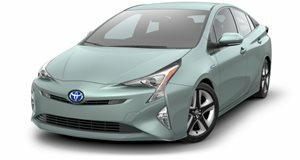 But with the Prius Prime offering a stylish PHEV option, is the Prius now just a fossil in a rapidly evolving future? Older Priuses (or is the plural Prii?) had a futuristic cabin design that indicated something forward-thinking, though they were let down by sub-standard plastics. The new interior is far more conventional, and is backed up by quality materials and build standards. For some reason, Toyota seems intent on sticking with a gauge cluster mounted atop the center of the dash, forgetting that the driver is on the left. The cure for this is an optional heads up display that shows the driver all the key information. A 7-inch touch screen handles infotainment, but it features the clumsy Entune connectivity app. The rest of the controls are logically laid out and accessible. The Prius seats 5 in plenty of space – more than the Hyundai Ioniq – in a well-appointed cabin. Cargo space is also impressive at 24.6 cubic feet with a spare tire. Models without it get an extra 2.8 cubes. The adoption of a multi-link rear suspension over a torsion beam for the latest Prius ensures that ride quality is now vastly improved. It’s not class-leading compared to other sedans of a similar size, but it feels solid, does a fair job of ironing out bumps and ruts, and maintains a good contact with a fair amount of body roll. Handling is decently nimble, and it’s backed up by a decently weighted steering system. It’s not oozing feel or feedback, but it does the job in a more than acceptable manner. However, braking really isn’t the Prius’s forte – the pedal lacks feel and is unpredictable in how it will respond. The stopping power is decent, but not best in class by some margin. The Prius also loses brownie points due to increased levels of road and wind noise compared to previous models. Glacial performance is the trade-off you knowingly make when you purchase a Prius. All models pair a 1.8-liter gasoline engine with two electric motors for a combined output of 121 horsepower. Front wheel drive is standard through an economy-focused continuously variable transmission. 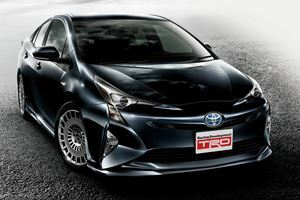 Prius One and Two trims utilize a nickel-metal hydride battery, but all higher trims and Eco trims get a new lithium-ion battery that weighs less and carries more juice. Standard models are rated by the EPA as having 54/50mpg city/highway ratings, while Eco models increase those numbers by 4- and 3mpg respectively. Economy figures are real-world achievable. With 7 trim levels, there’s a massive array to choose from when it comes to equipment, with available features like automatic LED headlights, leather upholstery, a rear-view camera, and the option to upgrade from a 6.1-inch touch screen to a 7.0-inch unit. Prius Three and Four models can be opted with the heads-up display and a sunroof. All Priuses/Prii now feature Toyota Safety Sense P pre-collision safety system with pedestrian detection, lane departure alert, radar cruise control, and auto high-beam assist. Blind spot monitoring is available with rear cross traffic alert. The Prius earned the title of IIHS Top Safety Pick + and earned 5 stars from the NHTSA. Now in its 4th generation, the Prius is better than ever before. There are some downsides, and Hyundai’s Ioniq is worth a look as a competitor, particularly if you still can’t get over the Prius’s exterior design. Perhaps the best place to be to avoid that is inside a Prius. 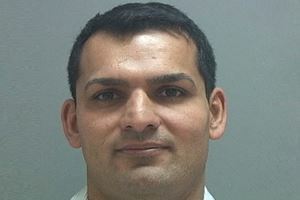 This man squeezed $55,926 out of insurance companies one fender bender at a time. The Prius has changed a lot since 1997, but car enthusiasts still hate it. Add them to the endangered species list?